Joined by exceptional Canadian guest artists and the superb Toronto Mozart Players, Pax Christi Chorale continued to grow as an ensemble of high calibre and a cultural beacon in our city. Each of our three programmes offered an exhilarating concert experience. Sunday, October 29 2017, 3:00 p.m.
Download the Romantic Masters Program. Saturday, December 16 2017, 7:30 p.m.
Sunday, December 17, 2017, 3:00 p.m.
Download the Die Schopfung Program. Our 30th anniversary season saw inventive performances of choral favourites, including the Canadian premiere of Elgar's The Apostles. 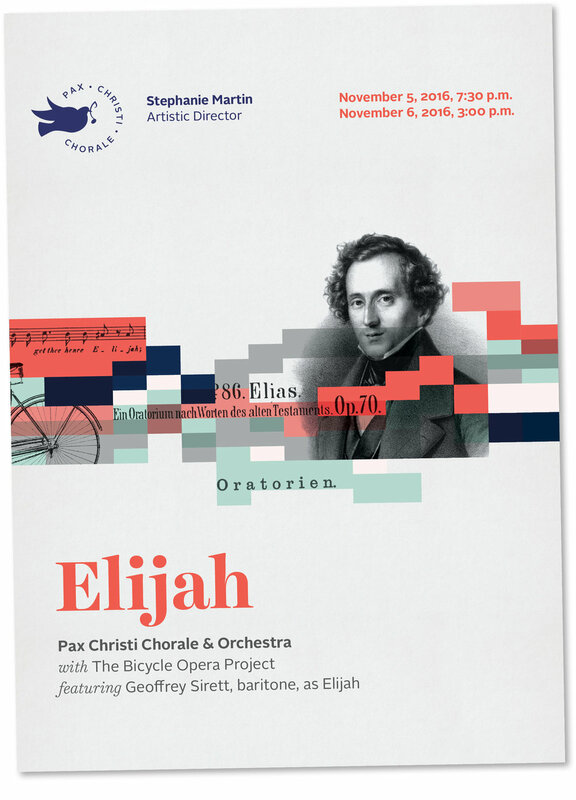 With The Bicycle Opera Project, featuring Geoffrey Sirett, baritone, as Elijah. Download the Elijah Concert Program. Why Elijah? Read The WholeNote's take on Pax Christi's interpretation of Mendelssohn's final oratorio. Listen as Stephanie Martin talks with David Perlman of The WholeNote and Noel Edison of Toronto Mendelsson Choir about the history of the oratorio and their own productions of Elijah. Download the Ode on the Nativity Concert Program. Like Bach’s St. Matthew Passion, Elgar’s masterpiece provides profound, poetic insight into the ancient story of ordinary people grappling with epic events unraveling around them, painted larger than life by a masterful musical story teller. Download The Apostles Concert Program.